In her recent book, Greening Death—Reclaiming Burial Practices and Restoring Our Tie to the Earth, writer, farmer, and feminist scholar Suzanne Kelly looks at the development of a grassroots movement that has been leading people towards more sustainable burial practices. Beginning with an overview of the history of death care in the United States, Kelly demonstrates how we came to accept as conventional the environmentally harmful practices set in motion by the American funeral industry. In doing so she makes a powerful argument for a return to age-old methods of disposing of the dead, specifically those that promote the natural decomposition of bodies. In addition to making the case that synthetic elements like embalming fluids, caskets, and liners place unnecessary strain on the natural environment, Kelly encourages us to consider an additional argument in favor of green burials: the elimination of these elements can aid in the grieving process by bringing the living closer to the dead. Kelly’s previous scholarship has focused on environmental feminist philosophies of nature and the female body, examining the ways in which our culture treats these spaces as “both playground and dump.” Her writing and work as a green burial advocate carries forward those themes, helping us to see how our physical selves are inextricably linked to the natural world, in life and in death. The Straddler met with Kelly in New York’s Hudson Valley to discuss her research into the environmental and political implications of present-day death care practices in the U.S. In 1963, Jessica Mitford published her landmark book, The American Way of Death. She took the funeral industry to task for taking advantage of the bereaved and for creating rituals, or quasi-rituals, that people didn’t identify with. Her book touched a nerve with the American public and some good things came out of that. For one, the Federal Trade Commission came down with their Funeral Rule that forced the industry to itemize everything they were selling. Memorial Societies popped up all over the U.S., and for the first time people really began to see themselves as active funeral consumers. In a way, people became sort of radicalized around death care—at least when it came to paying less for funerals. And as long as funerary care is something we purchase in the marketplace, seeing ourselves as consumers of death care will be important. If someone close to you died today, you would probably go to a funeral home to make arrangements—but it’s not likely that green burial would be offered as an option. So the Green Burial Movement is absolutely about making available to the consumer what has not been available. But one of the things we’ve been witnessing over the last couple of decades is that there are also limits to such a consumer platform for change. Yes, cost matters and our consumer choices matter. But focusing so much on cost and appealing to the choice-makers in all of us has done little to tie us back to more meaningful death practices, which is what we are really witnessing with the Green Burial Movement. Green burial, otherwise known as natural burial, is a way of caring for the dead with minimal impact to the environment. That means whole body earth burial without the use of chemical embalming, without the use of sealed hardwood or metal caskets, and without the use of a burial vault—the trio of practices typically used in the conventional American way of burying the dead. In some ways, green burial is about going back to the old ways, the way we buried our dead before death became industrialized in the U.S. At its most basic, a green burial ground allows for the burial of the body without those conventional practices. But there are other aims to the Green Burial Movement. One of the greatest aims can actually be found in the origins of the movement, the focus on land conservation. The first green burial ground in the U.S. was founded in Westminster, South Carolina, by Dr. Billy and Kimberley Campbell. At Ramsey Creek Preserve the Campbells wanted to provide whole-body earth burial, without that trio of practices: embalming, caskets, and vaults. But they also wanted to tie the fact of human death to the conservation, preservation, and restoration of lands. The idea was that the proceeds from the plot sales would help to further conserve the burial ground lands, and also other lands, in perpetuity. Those lands would forever be preserved from development. These Conservation burial grounds, as they’ve come to be called, are best achieved through partnership with some kind of conservation entity, like a land trust. Some burial grounds have teamed up with conservation organizations from the start while others have done so after they were already up and running. Prairie Creek Conservation Cemetery, outside of Gainesville, Florida, emerged through discussions between an interested group of citizens and a land trust. The people at the land trust liked the idea and said, we’re going to find a piece of property, or, we’re going to try to use one of our land holdings to make this happen. Ramsey Creek, on the other hand, was already operating and then sometime later found a land trust to partner with. 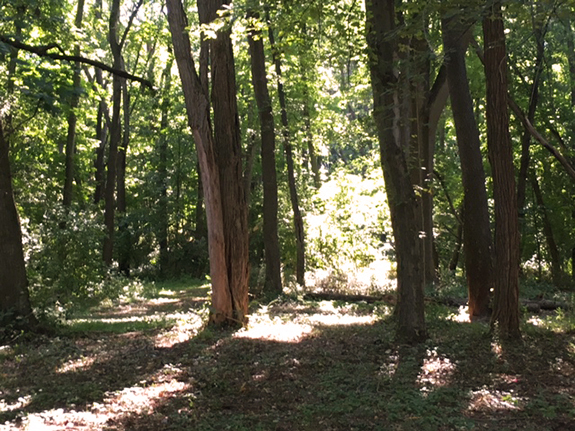 There are other burial grounds, like Greensprings Natural Cemetery Preserve outside of Ithaca, New York, that all but function like Conservation burial grounds, but have yet to secure such a partnership, though they’d very much like to. When I was writing the book, there were more than one hundred green burial grounds nationwide. But out of those, only about seven or eight were bona fide Conservation burial grounds, with a few more in the works. It’s a very small percentage. So even though the origins of the movement can be found in conservation, most burial grounds right now in the U.S. are focused more on the basics of green burial and less on the conservation, preservation, and restoration of lands in perpetuity. With the movement growing in this way—with green burial grounds varying in how they care for the land—the differences between them should be clear to the public. That’s why certifiable standards are important. The Green Burial Council (GBC) is a not-for-profit, third-party verification and certification organization that sets standards for green burial grounds. The GBC has three tiers of certification, and certification is voluntary. Their bottom tier doesn’t have any focus on land or landscape-level conservation, but the middle and top tiers do. The top tier involves being partnered up with a conservation burial ground, as I just talked about. The second tier does not have a partnership component, but is required to file a deed restriction that runs with the land. The deed essentially says the piece of land is not only a burial ground for human remains, but that it is a natural burial ground and must always function as one. It’s a way of ensuring the burial ground will never revert to conventional practices. At the top tier, the conservation organization acts as an added layer of protection, another governing body that is actually stewarding the land, that comes to check on the land every year. Without this added protection the level of conservation between the middle and top tiers can vary widely. Conservation is but one goal of the movement, but there are a whole host of other reasons why people might choose green burial. For some, there is a religious component. It’s just an expression of what they have always done, especially with respect to Jewish and Muslim practices that have always eschewed burial vaults and embalming and opted for simple burial containers. But in recent years, even Jewish and Muslim dust-to-dust death rites have been impeded in many cemeteries across the U.S., where burial vaults or liners have become mandatory. As a result, what we’ve seen is the development of what seems almost redundant—the first “green Jewish burial ground” was established in California in 2010. Some Christians are also finding evidence for green burial within their own traditions and some burial grounds have developed directly because of that. Interestingly, the majority of them are Catholic, perhaps because the religion is so heavily ritualized. Generating rituals that bring death back into the circle of the living seems foundational to the movement. Green burial ground owners and operators all tell of the hands-on quality of green burial practices. Families journeying with the body to the grave, lowering the body into the hole, and often filling the hole back in. This is one of the reasons why green burial advocates, who once said they would opt for cremation, like the idea of green burial better. Cremation rates are as high as 50% nationwide today, which speaks to people’s widespread disenchantment with conventional burial practices. But apart from the scattering or interment of ashes, few rituals have developed around seeing the dead off. Take direct cremation, where a body goes from the morgue to the crematory with no family involvement. And even when there is family involvement or a funeral, most people still don’t go to crematories to witness the incineration. There are some communities that have long done this in the U.S.: Hindus, for example; but for many folks cremation in the U.S. is a disaffecting process. What we’re seeing with green burial is a focus on proximity, a closeness with disposal; bringing the family or the bereaved inner circle back into the rituals around death. The green burial ground in Rhinebeck has been open for about two years. Before that, my access to green burial was, like most folks, rather limited. Having gone to every burial that we’ve had so far, I’ve been privileged to witness the ways that people are making meaning out of these experiences. There is something about seeing down into the hole, and not having it draped by anything, having the dirt piled right there next to the grave opening—fully exposed, unhidden, watching the body lowered into the hole, the forest floor alive and diverse beneath us, and then seeing the dirt falling on top of the body at the hands of family and friends. There is a kind of engagement, as opposed to just walking away. And there’s also no confusion over what’s happening. It’s about how it makes people feel—something about being in the presence of life when you are also in the presence of death. This is not a top-down movement. This is grassroots work. Still, not all communities are being touched by green burial. It remains to be seen how some communities that are not now well represented in the movement will come to make sense of the reemergence of these practices in an age of environmental concern. For example, African American communities have historically held highly ritualized funerals that take on a lot of the conventions of the funeral industry. But the history that informs the embracing of those practices is one of injustice and violence. In early, colonized America, local communities cared for their own dead. But when funerary care became formalized and industrialized in the late 1900s, only white men were permitted into its ranks. This left communities of color with little recourse; they were forced to hand over their dead to white funeral directors. African Americans fought for entrance into the industry not merely for the right to make a living in the trade, but for the right to take care of their dead and pay homage to black lives. Taking on the sanitizing practices of chemical embalming, the modern casket and the burial vault has in many ways been about dignity and respect. So particular histories and locations must inform engagement with emerging green burial practices. The movement cannot justly grow in any other way. There’s also the matter of urban communities, which make up about 80% of the U.S. population. Right now, green burial grounds are developing outside and sometimes far from urban areas. For people in cities who are thinking green, their identity may be very much tied to urban life and the idea of turning to the wilds of nature may not be appealing. So, I think what we may begin to see is more development of green burial grounds within or closer to urban areas and alternative green ways of disposing of the dead—like Katrina Spade’s Urban Death Project (which is a design for what can only be described as a human composting machine, and center). Making cremation a greener choice is also part of this. Right now, cremation is surely the second most environmentally sound way of disposing of the dead. If it’s less than ideal, that’s because anytime you burn something you pose a threat to soil, water, and air. In parts of Europe they’ve done a much better job of placing filters on crematories; we have a long way to go with that, and also with finding more energy-efficient ways to run our crematories. If those things were put in place, burning would be a lot cleaner. But it still may not be the answer for many people who feel disconnected from the industrialized, crematory process. As the movement grows from disparate communities, what’s most clear is that this is a movement of the people, not of the industry. Not just to do death differently in a more environmentally sustainable way, but to re-mean death in ways that have been absent for too long. I suppose this is one of the reasons I worry about stories that herald green burial as just another consumer choice. They mask the deeper issues that are at stake here, which are that people are waking up to death practices that they don’t identify with and reclaiming ones that have been seemingly lost to them. This is a resurgence of knowledge and meaning that people have been cut off from. Once people tap into those things, there’s no turning back. The issues of pollution and waste are obviously important. But this is also about forging a powerful partnership with each other, with our experiences of death, and ultimately with our earthly home—the home we all share. Douglas Davies and Hannah Rumble, two anthropologists in the U.K., have been charting the progress of green burial (otherwise known as woodland burial) over the last couple of decades. And they have found that green burial is ultimately a form of gift-giving. They draw upon the work of Marcel Mauss, the French anthropologist, who talks about how in all cultures, gifts must be circulated in order to create healthy, mutual relationships between groups of people. But because gift-giving is a reciprocal gesture, if you’re always taking and taking and never giving back, equitable relationships can never grow. Of course that’s the relationship we currently have with the earth, especially as it has manifested over the last 150 years. This idea came through in many of the interviews I did for the book, and we see it over and again even in mainstream media stories on green burial—that each and every one of us has been the beneficiary of earthly resources and that at the end of our lives the very least we can do is give something back in return. It seems to me that the most important thing about the circulation of gifts is that when we give, part of the gift always remains with the giver, making the giver and the receiver forever bound to one another. When we gift our dead bodies to a nature that has given us so much during the course of our lives, we further secure that bond. Perhaps that is the central spiritual component of the green burial movement, fostering our enduring relationship to the earth, a bond that, for far too long now, has been broken. This radicalization changed attitudes around the proposed cost of death care, most notably, and also helped give rise to the increase in cremations. Dr. George William Campbell and Kimberley Campbell opened Ramsey Creek Preserve in 1998. Prairie Creek Conservation Cemetery in Gainesville, Florida, was founded in 2007.